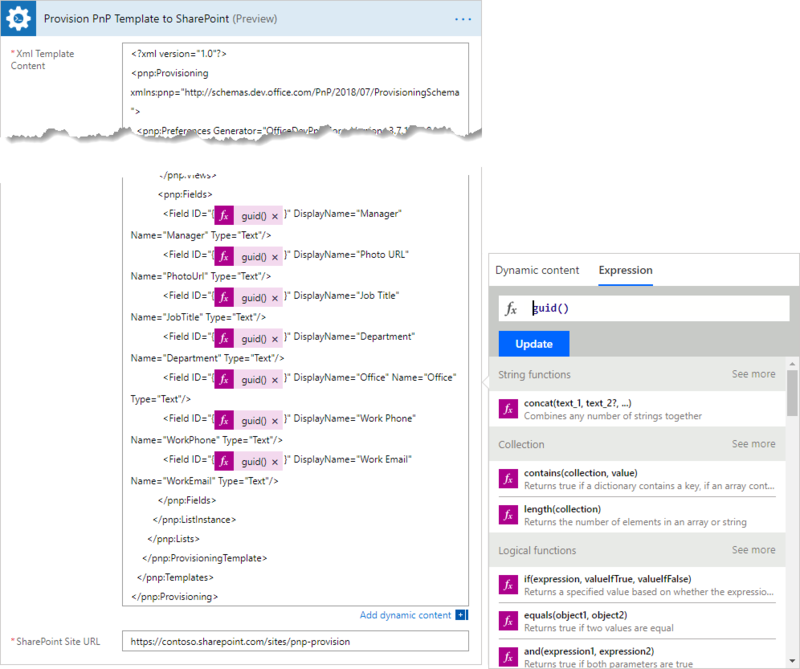 This article will show how to create a custom SharePoint list or library using PnP provisioning template. You can use this approach to create lists or libraries of any complexity in SharePoint. For example, you may want to create an employees list with a set of predefined columns for your team. We will do it below. PnP template is an XML file that contains a description of SharePoint entities (lists, libraries, pages, etc.) that will be created. You can create own XML template for your SharePoint list or library. 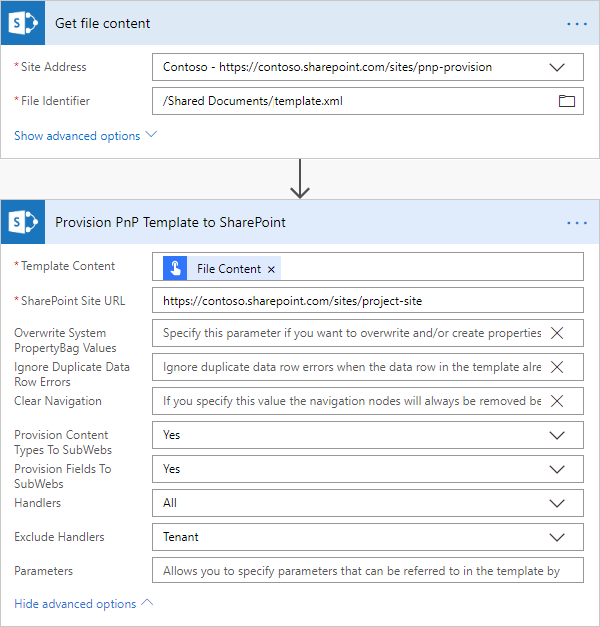 Then use the Provision PnP template to SharePoint action from Plumsail Actions to apply PnP templates to your SharePoint sites using Microsoft Flow or Azure Logic Apps. Write a PnP template manually and provision a simple list - It is useful for simple lists without custom views or content types. Get a PnP template from an existing list and provision a complex list - It is useful for complex lists with content types, views, site columns. You will find the description of both approaches below. Pick the one that you like more. Let us review what you can change in the template. <pnp:ListInstance> tag represents a list. You can change list title (Title) and list URL (Url). Also, if you want to create a document library, you need to change TemplateType to 101 instead of 100. You can find all the available template types in the official Microsoft documentation. DisplayName is a display name of the field. Name is an internal name of the field. Type represents a type of the field. You can find all the available types in this article. ID is a unique ID of the field. You can put here unique GUID or fill it dynamically in your Microsoft Flow. See the example below. For more information about tags available in PnP templates review PnP provisioning schema. You need to replace all values for Field IDs using Microsoft Flow expressions like on the screenshot above. It will ensure that your fields will always have unique IDs. This approach is useful when you want to create simple SharePoint lists or document libraries. If you have a complex list with many views you may consider another option with creating your template from an existing list using PowerShell. For more information read below. But this command creates a template for all lists and libraries on your site. If it is your case, you can use the code above. Otherwise, you need a workaround. In the first line we specify title of the list. You need to replace "Employees" by the name of your list. In the second line, we specify the location of the output template file. You can change "template.xml" to another path. The rest of the code takes a template for all lists of the site. Then it removes all the lists except the one we need. Once you executed the script, you will have the template for your specific list or document library. This script gets a template of a list without external references like content types, site columns, etc. If you need to include them into the template, you need to modify the PowerShell script or do it manually in the XML. You may also be interested in this article explaining how to provision site using PnP template.